This wine is a blend exclusively composed of Grand Cru with 65% Pinot Noir from Aÿ Grand Cru and 25% Chardonnay from Mesnil-sur-Oger Grand Cru, and 10% of vinified red Pinot from the Philipponat vineyards of Mareuil sur Aÿ. Why 1522 ? 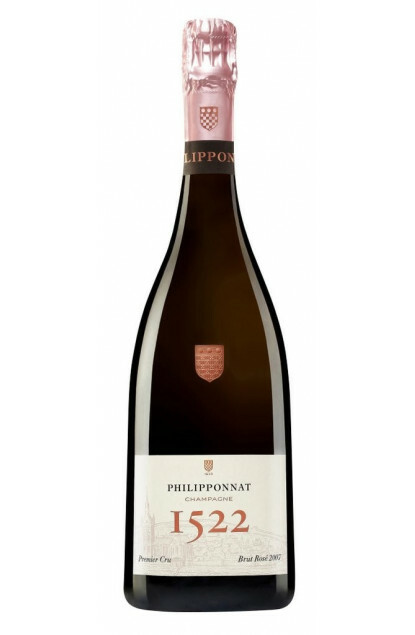 This name is a nod to the date when the Philipponnat family established roots in the town of Aÿ, in the heart of the Champagne region. Fermentation takes place for a small part in barrels, and ageing in bottles, on lees, for 5 to 6 years. The colour is a pale pink with a few purple reflects. The attack to the nose is on red and black berries like wild strawberry and blackcurrant. To the palate prevail touches of raspberry and blackberries (blackcurrant). To be served around 9-10°C, in association with seafood or shellfishes or poultry like Christmas capon or an Indian tandoori. This 1522 vintage can be kept 10 years at least in coolness and darkness, bottle laid flat : it will then gain in smoothness and complexity.